Thursday, August 18. 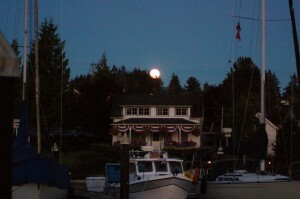 My last full moon in Gig Harbor. God willing, the next full moon picture will be on or of the Pacific Ocean. The excitement rises by the day. Seth, my youngest son, is helping me again with the electronics and navigation software. 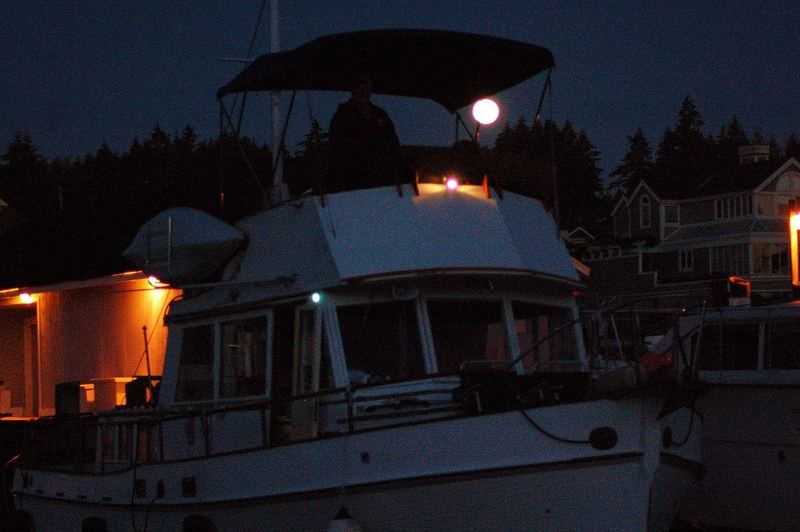 Yesterday he cranked me up to to the masthead, to replace the broken lens for the tri-color light. 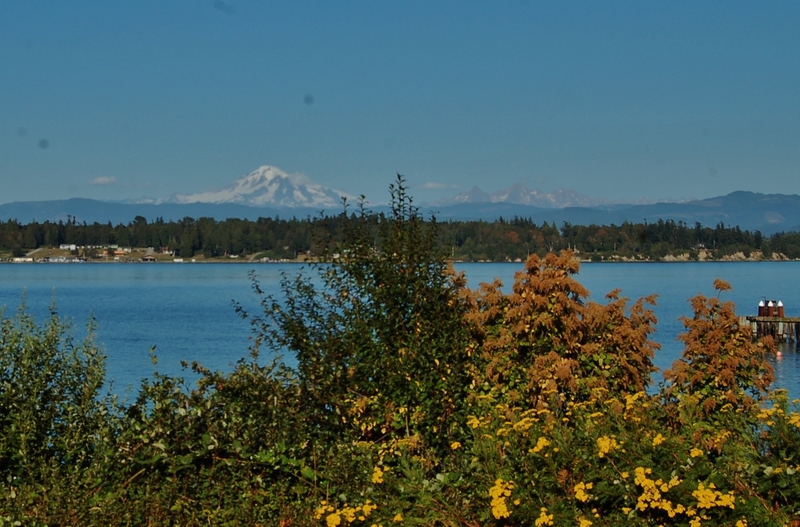 Another reminder for my farewell party here in Gig Harbor on September 6th, from 6 to 8 p.m. A group of helpful lady friends is organizing the event with my daughters as a potluck. 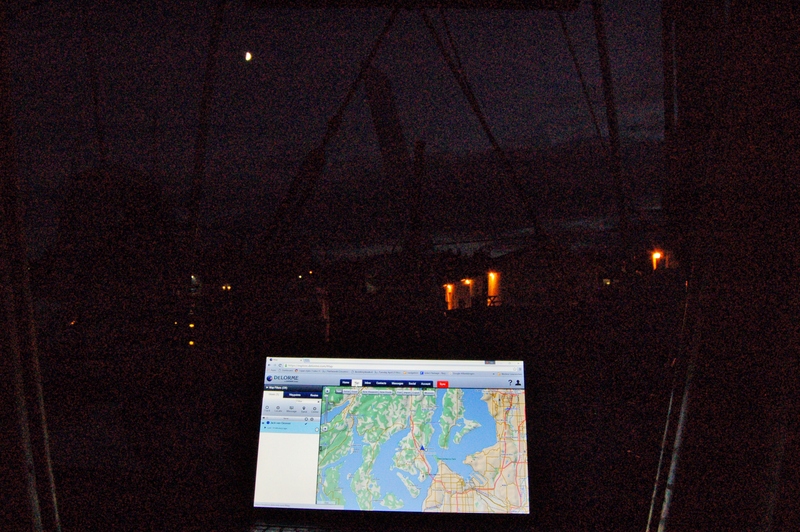 Besides the info I posted on my previous blog, you will be able to find my boat position on www.MarineTraffic.com, I have added my MSSI number in the upper right hand corner of this web site. 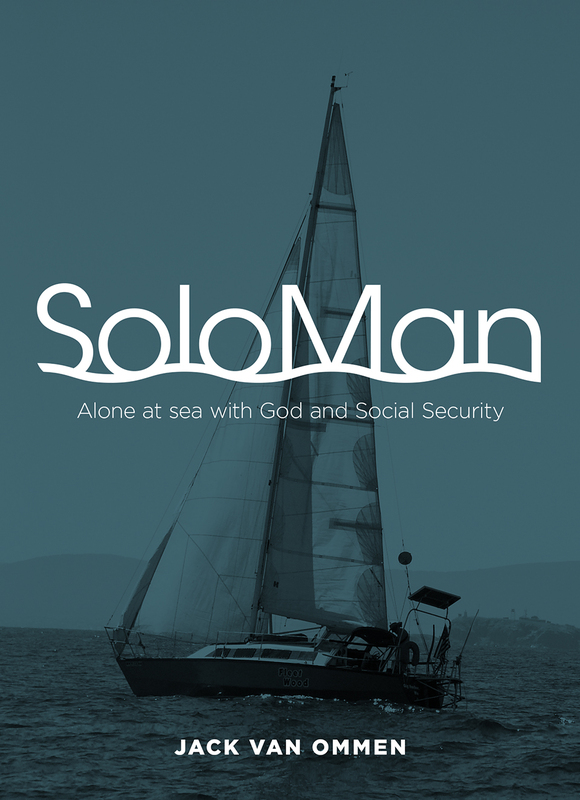 That will be the subtitle to the Sequel to “SoloMan”. Last night I posted my first track position to this incredible versatile rescue/tracker beacon. 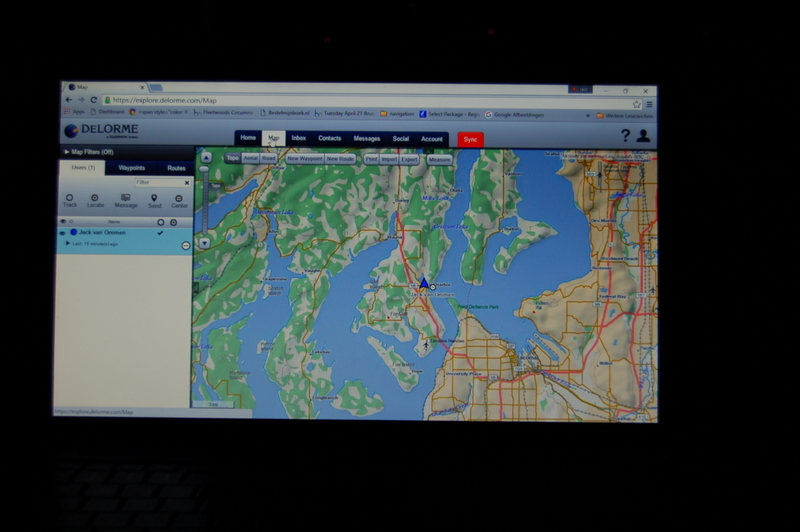 You can learn more about this at their web site http://www.inreachdelorme.com/product-info/inreachse.php This solves the dilemma I had in trying to stay in touch with my family and friends, at sea, since I lost the SailMail capability I had on “Fleetwood”‘s predecessor. This saved me the expense of the $500 annual subcription and the purchase of a Pactor modem, which can run close to $3,000. The new boat came with a SSB radio and ecellent tuner and backstay anenna but the radio has a bad reputation. But I can use it for SOS calls and to listen to the weather reports. The SailMail allowed to update my blogs. But this is not as critical because from here onward I shall not cross any oceans and most of my passages will be under a week’s length. I will blog from shore when Wi-Fi is available. You will be able to check my position at the URL I have now permanently posted under the top right picture of me leaving the Golden Gate in 2005. Shortly after I sufered my shipwreck on November 16, 2013, Richard Spindler of “Latitude 38” put out a call for my assistance and he promised to donate the EPIRB for the replacement equipment. He suggested then to check this alternative out. In my case as a solo sailor it performs all the functions as a rescue beacon that an EPIRB provides plus all the other functions, including two way texting, weather forcasting, etc. I chose the subscription for the different services the host provides that I can interrupt while I am ashore. I will keep the service going when I do my planned backpacking trip from Catagena to Southern Chile next summer. This is the picture I took last night, under a waxing moon from the companion way, how the track shows up on my laptop by going to the above link. You have a choice to see it as well from Google Earth. The subscrition I chose costs ten cents a minute for the texting and pinging. So, please, do not text or ping me on this link. If you have an urgent message contact my daugther Lisa. 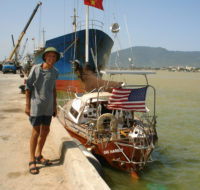 Many of you will remember her from the time she forwarded my SailMails from 2005 until I was able to blog from the boat. Her e-mail address is stil the hotmail one. It was a welcome break from the chores to prepare “Fleetwood” for her September 12 departure. The short ferry ride from Goose Berry Point to the island brings you in a totally different world. The majority of the ferry passengers are locals since there are no hotels on the island and they all know one another. You leave your preoccupations on the mainland side. My friends Sid and Leslie live on the beach on the Lummi reservation facing the island. We met on a ski charter flight to Austria in 1972. Sid designed all three homes I had built in my previous life. His younger brother David and wife Charlotte live on the island. 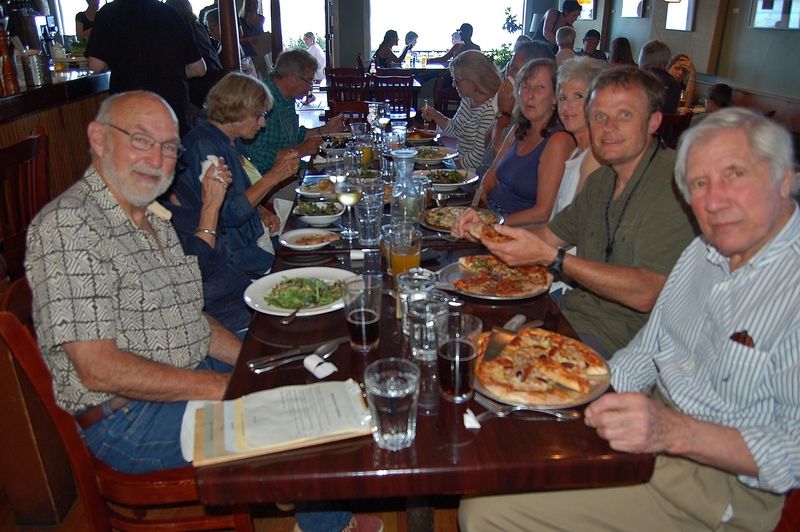 It was Sid’s 78th birthday on the 27th and we celebrated this, before the presentation I gave at the Lummi Island Library, at the restaurant above the ferry landing. 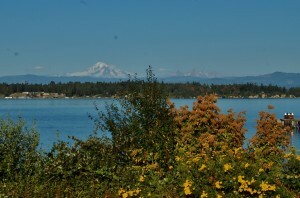 It was a beautiful summer evening with a gorgeous view across Hale Passage of Mount Baker. B-day boy on left front. May I look as good as Dewey on right when I pass my ninetieth b-day. We were thirteen at the table and made up nearly one third of the presentation audience. Giving presentations is a new skill that I am slowly acquiring. My dear friend Leslie sat down at the Sunday breakfast table and gave me some helpful suggestions. Leslie is the one who gave me the right pick for my first sailboat in 1976, she counseled me in 1972 when I became a single dad, I could have saved myself some heartaches and disappointments in my relationships after my divorce if I would have heeded her advice. 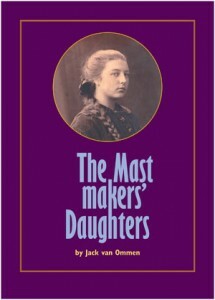 Their home was a regular overnight stop on my frequent business trips to my Canadian sawmill suppliers. These friendships are very precious and it was a delight to see their friends and relatives. Leslie’s son Mike and Sid’s son Doug were with us with their spouses. They were around Lisa and Rose Marie’s age, then respectively four and eight years old when we met in 1972.